A lighthearted dramatic-like comedy, this animated film clearly is in the same league as its prequel. We all know the story of the little boy disabled boy who proves to everyone that just because he is disabled, he is not handicapped. Oh- wait. It was a fish- and the movie was called Finding Nemo (Disney Pixar Films). In the much anticipated and eagerly awaited sequel, Finding Dory brings to like the bonding of a diverse family and shows us that in a true family, there are no limits as to what family will do to help each other. Our favorite Blue Tang fish, Dory (voiced by Ellen DeGeneres; Finding Nemo) has been living with our favorite Clown fish, Marlin (Albert Brooks; Finding Nemo) and his son, Nemo (Hayden Rolence; Cicero in Winter). Of course, with Dory having short term memory issues and literally not remembering anything she just did, Marlin and Nemo really have their hands full taking care of Dory. Despite her memory issues, Dory is a happy fish and finds amusement in the littlest things. She is also a source of continuous entertainment to Nemo's school friends. Even though Dory is happy with her adopted family –and loved- she knows she is missing something- if only she could remember. What is it? Finally, she remembers she has parents and sets out to find them, accompanied by Marlin and Nemo. Their escapades are hilarious and heroic all at the same time. And, as true to the first movie in this series, where someone is on their own, Dory inadvertently wanders off by herself and Marlin and Nemo engage everyone they meet to assist them in finding Dory. Besides our favorite sea turtles, Finding Dory introduces a new generation to the world of the creatures of the sea, meeting new friends such as the sea lions Fluke (Idris Elba; Star Trek Beyond) and Rudder (Dominic West; The Awakening) and Hank the Octopus (Ed O'Neill; Married with Children). The secret of how Dory came to speak whale are revealed as we meet the Beluga White Bailey (Ty Burrell; Mr. Peabody and Sherman) and nearsighted whale shark Destiny (Kaitlin Olson; Escape From Planet Earth), Dory's childhood playmate. Diane Keaton (The First Wives Club) plays Jenny, Dory's mother, with Eugene Levy (American Pie) voicing Charlie, Dory's father. As Marlin and Nemo try to negotiate a way into the facility with help from sea lions, Dory finds herself trapped in a rehabilitation holding area, meeting octopus Hank (Ed O'Neill), who wants to escape and live the good life in a Cleveland tank. Trying to collect her thoughts and find her parents, Dory receives help from Bailey, inching closer to her dream of a reunion. Directors Andrew Stanton and Angus MacLane do a beautiful job bringing Dory's story to life. Stanton, along with Bob Peterson and Victoria Strouse, wrote the screenplay. The dialogue was funny and cute. The jokes were caught by all and the storyline appropriate for all ages. Teaching us to work together and to trust each other is a lesson that can be appreciated by all. Creature Features: Fish facts with Albert Brooks, Eugene Levy, Kaitlin Olsen, and the other actors about the types of fish and underwater creatures they voice. Living Aquarium contains Sea Grass, Open Ocean, Stingrays, and Swim to the Surface and are lovely screen savers that can be left on with these particular themes. Deleted Scenes: Can someone tell us why any scenes were deleted? The Blu-ray is presented in MPEG-4 AVC with a 1080p resolution and an aspect ration of 1.78:1. The colors are vibrant and the aquarium scenery pops in ever sequence. Audio is presented in HD Master Audio and 2.0 Descriptive Audio, Spanish and French 5.1 Dolby Digital. The audio is so clear that you can hear the swoosh of the water, as the fish's fins sweep from side to side when the swim. You can hear the "plop" and splash of the water without over stimulation. The dialogue is clear and the tone quality, impacting the mood of the characters, is evident. The Blu-Ray/DVD combo comes with three discs- one each for the Blu-Ray and DVD presentations; and the third for the Blu-Ray bonus features. In addition, the Blu-ray also comes with a Digital HD downloadable copy. Meet new friends and join our favorite fish on the journey to find Dory's parents. A lighthearted dramatic-like comedy, this animated film clearly is in the same league as its prequel. Download Finding Dory from the iTunes Store in Digial HD. 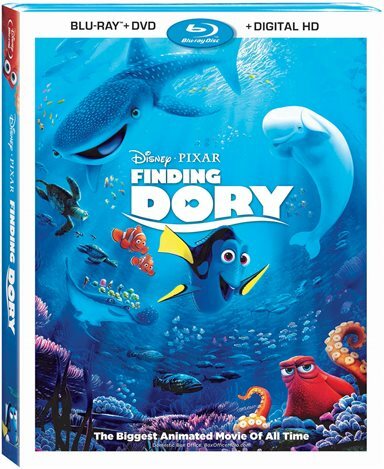 For more information about Finding Dory visit the FlickDirect Movie Database.